Last Friday, Red Cross certified lifeguard and water safety instructor Andy Slutsky appeared on FOX 5’s Good Day New York. The morning show’s theme was a pool party to kick off the Fourth of July weekend. Anchors Rosanna Scotto and Greg Kelly made sure to remind people to be safe while having fun. 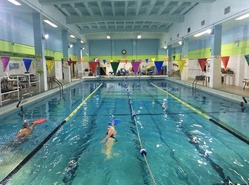 Andy talked about pool safety and why it’s important to make sure both adults and children know how to swim.